Editors note: We have a guest post today from local eater Esther Fox. If there were three things that I could eat for the rest of my life, they would be burgers, mac & cheese, and bacon. Not necessarily in that order. However, if you decided to throw all three of those delicious things on a bun and serve it up with an equally satisfying beer, I would be in heaven. Sweet, juicy, greasy, alcoholic heaven. Insert Lucky’s Last Chance in Manayunk. My husband, Mr. Fox, and I decided that, since we had actually never set foot in Manayunk before (which is a shame, since we’re both from Philly), we would try something new. We both had a burger craving, and decided on Lucky’s Last Chance, upon reading some favorable reviews on the internets. They were apparently well-known for their “creative” (as one person on Foursquare described it) burgers, hot dogs, and craft beer. And since you know I love a good burger and a good brew, we were on it like white on rice. Upon walking in to Lucky’s, you have the choice to go upstairs to their nightclub (which opens at 10pm) or a door on the right led you to the bar. For a Friday night in Manayunk, it was surprisingly uncrowded, and we got a decent table toward the back. Their bar area is somewhat small, compared to other bars, but it definitely had that neighborhood bar feel to it. 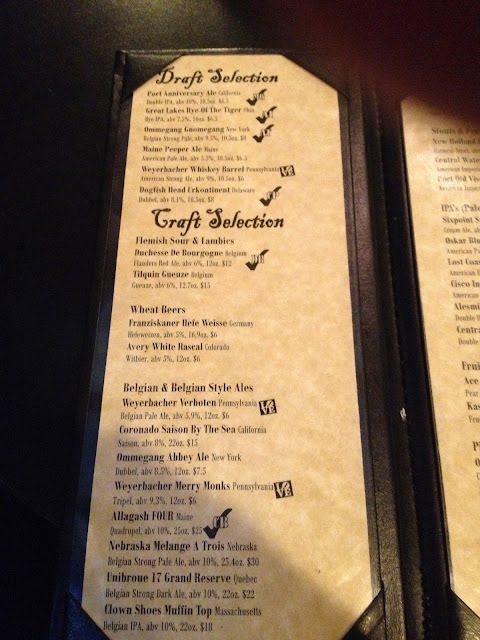 We were immediately greeted by the bartender and presented with a beer list and food menu. “Our best seller: burger topped with cheese, then a heaping pile of mac & cheese, and then more cheese. Simple, comforting, cheesy goodness”. It was at that moment I knew it had to be mine. As I mentioned before, I have a penchant for a good burger and some fine mac & cheese. Put them together and, ding ding, we have a winner! Lucky’s burgers come in two sizes: standard and junior. A standard size is two 1/4lb hand-pressed patties, whereas a junior is just one 1/4lb patty. I opted for the standard, since I didn’t really know what to expect. They offer a few standard toppings for free (mustard, relish, and raw onions), as well as a few upcharged toppings like sauerkraut ($.50), cheese ($.50), jalapeños ($.50), chili ($1), and bacon ($1). I opted to add bacon to my burger, simply because, well, it’s bacon. Bacon makes everything better. Keeping with the mac & cheese theme, Mr. Fox ordered the Scorpion Dog, which is a hot dog with jalapeños and mac & cheese on it. We also got an order of their garlic butter fries, which are crinkle cut and drenched in garlic butter and fresh grated parmesan cheese. I mean, how could you go wrong with that? To go with our insanely unhealthy main course, we got some fantastic beer, just to round out the meal. I got a Port Brewing Co Anniversary Strong Pale Ale, which they had on draft, and Mr. Fox got the local Weyerbacher Merry Monks, a Belgian style golden ale. They were each served in proper glasses, which is surprising since most places we go serve their draft and bottles in the same substandard glasses. So it was refreshing, in all senses of the word. Our food came, and, wow. I couldn’t help but gaze at the gigantic meaty cheesy mass of deliciousness in front of me. When you get to know me, you’ll realize that I base a lot of my burger reviews on the taste of the meat and the quality of the bun it comes on. The Mak Attack certainly did not disappoint. Placed in front of me were two perfectly medium patties smothered in a white cheddar-based mac & cheese, with crispy smoked bacon. And the bacon was perfectly placed in little crispy bits all over the burger. If it’s one thing that annoys me about restaurant burgers, it’s when they take whole slices of bacon and place them in an “x” on top of the patty, therefore making you get whole bites without bacon-y goodness. This is not proper placement people! You need to break it up and cover the whole burger for optimal bacon/meat consumption. Normally, I will scoff at a burger if I don’t have to cut it in half. If there’s no point in cutting it in half, that means there aren’t enough toppings on it to make it worth my while, or the patties aren’t big enough. However, this monster of a burger had to be cut in half. There was no possible way for me to eat it without everything falling off. The bun that it came on was a surprise to me, as it appeared to be freshly baked, with a dusting of flour on top. Not too soft, but not too crusty either. It looked like one of those artisan buns you can buy at a fancy bakery, and believe me, it tasted like it as well! Lucky’s must brush them with butter and then throw them on the grill, because each bite yielded a buttery pop of flavor that was tasty, yet not overpowering. That, combined with the perfectly seasoned not-uniform patties (truly hand-pressed if they’re not uniform in size), smoky bacon and sharp bite of the white cheddar in the mac & cheese, made this beautiful disaster of a burger a winner in my book. Not only for the deliciousness, but also because I didn’t have a pile of grease left on my plate when I was finished. The burger was juicy, but it was not greasy. That alone gets an A+. The other winner of the meal was the garlic butter fries. As I mentioned previously, they were crinkle cut. And I know what you’re thinking, because I too have a dislike for crinkle cut french fries. They have a tendency to not retain crispness, and therefore, by the time you’re at the bottom of your basket of fries, you have a limp salty mess. Lucky’s garlic butter fries exceeded my expectations. The fries stayed crispy until they were completely devoured, which says a lot since they were doused in a delicious house-made garlic butter sauce. The addition of the fresh shredded parmesan cheese gave them a flavor that just worked. My only true complaint about the fries was that they didn’t toss them with the cheese before serving them, as they tossed them with the garlic butter. Since the cheese was only on top, the fries on the bottom of the basket missed out on the parmesan. But that was certainly not a deal breaker! As I mentioned before, Mr. Fox ordered the Scorpion Dog. While he cannot sum up his hot dog experience in a coherent paragraph, I can translate some of his thoughts. The bun was toasted to perfection in the same way that my burger bun was toasted, and sliced like a New England style hot dog bun (across the top instead of along the side). While there were jalapeños on top of the hot dog, they did not overpower the overall flavor, and were quite mild. We’re guessing they removed the seeds, and that was why it wasn’t terribly spicy. Finally, le pièce de résistance was the mac & cheese. I believe the word that Mr. Fox used was “transcendence.” I will just take him at his word. And unfortunately, he devoured the darn thing before I could snap a photo of it. Overall, our experience at Lucky’s Last Chance was definitely a satisfying one. The service was great for a bar, and the food was delicious. I don’t think I would change anything, aside from what I mentioned about the fries. It’s a great place to get together with a few friends for a beer and some good pub food, with a great atmosphere. And of course the amazing burgers. If you’re in Manayunk for the evening, definitely give them a try. You certainly won’t be sorry!